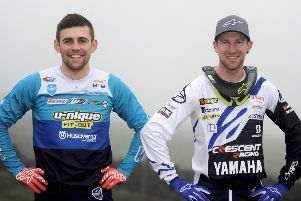 East Antrim riders Martin Barr and Graeme Irwin went head-to-head at the MX Nationals Championship during Saturday’s fourth round. Barr is now joint-leader of the series after third and fourth-place finishes at Weston-super-Mare. Barr qualified the BRT KTM second-fastest and in his opening race finished third after dropping back from second at one stage. In his second moto, Carrick’s Graeme Irwin on the Heads and All Threads Suzuki, crashed at the first corner and brought Barr down with him. Both riders remounted and Barr fought his way into fourth by the flag while Irwin was forced to retire with a broken engine. “The track was good and it certainly sorted the men from the boys,” said Doagh man, Barr. “Thankfully I didn’t break anything in the crash just seems to be muscle damage. I now lead the series with Kristain Whatley who was sidelined with a broken collarbone. Only one point separates myself, Whatley and Harri Kullas going into the next round so should be good tight racing,” he added. The following day, however, Irwin was competing in the Pro Nationals at the same venue and finished third overall after taking a third and a fifth-place finish. Jorge Lorenzo was untouchable at Sunday’s MotoGP in Mugello taking his 36th MotoGP victory and closing the points gap on Valentino Rossi to six. The Italian fans were treated to a dominant performance from Jorge Lorenzo as he stormed away to the win the race by over 5.5s. Ulster rider Eugene Laverty claimed the final points in 15th on the Aspar Honda.